Bats are the only mammals that can truly fly, but it turns out that they have other unique characteristics that separate them from most (if not all) other mammals. In a project headed by Dr. Peng Zhou, an international research team did extensive studies on bats. Bats are hosts to 100 different viruses, many of which are harmful or even lethal to humans.1 The team wanted to discover how bats can carry so many, and such deadly, viruses without getting sick themselves. Turns out that bats have a special ability. When humans or mammals encounter a virus or other disease causing agent, their bodies “turn on” an immune system response that begins to fight the danger. When no such dangers are present, the body “switches off” the system. The reason for this on-off switch is that when the immune system is on, it fights threats, but it also poses risks to the animal. Michelle Baker, a member of the team, stated, “In other mammalian species, having the immune response constantly switched on is dangerous—for example it’s toxic to tissue and cells.”2 Bats, however, never seem to turn off their immune defense system. Even when no viruses or diseases threaten bats, they always have their immune response switched on. 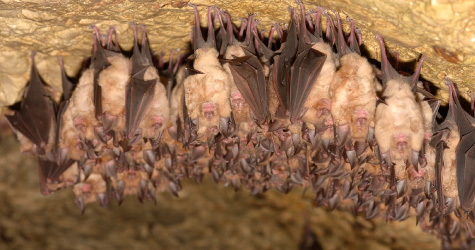 Baker noted that, in contrast to other mammalian immune responses that seem to harm their cells and tissues, “the bat immune system operates in harmony” with its body.3 What we see, then, is a mammal that can carry 100 viruses without getting sick, but that can easily transmit those viruses to other mammals and people. These findings shed illuminating light on the biblical food regulations that Moses penned in approximately 1450 B.C. In Leviticus 11, Moses instructed the Israelites to avoid certain animals. He referred to those animals as “unclean” and told the Israelites to avoid contact with live unclean animals or with their dead carcasses. Leviticus 11:19 lists the bat as one of those unclean animals. Moses’ instructions would have kept the Israelites from getting viruses transmitted by bats.4 An in-depth look at the list of all unclean animals shows a remarkable knowledge5 by the author for avoiding potentially toxic and dangerous food sources.6 There is no way that Moses could have figured these things out himself. He must have been guided by an all-knowing, supernatural Being. As we further explore the prohibition against eating or touching bats, a modern reader might wonder why even make such a law, because who wants to eat bats anyway? The fact is, however, bats have historically been “on the menu” in a number of countries. Lucy Maddox, writing for Science, penned an article in 2003 titled “Don’t Eat the Bats,”7 an instruction that sounds remarkably like what Moses said more than 3,000 years before she wrote her article. Maddox reviewed the history of the Chamorro people who live on Guam. This group was known to have unusually high chances of falling prey to a neurodegenerative disorder that can be debilitating and fatal. One reason suggested for this fact was that Chamorro people eat the seeds from the cycad plant. These seeds are known to have the neurotoxin BMAA in them. By washing the seeds thoroughly, however, most of the toxin can be removed. So, researchers were still baffled by the high rates of the disorder. Turns out that the Chamorro people like to eat “flying foxes,” Guam’s large fruit bat. The bats also enjoy eating the seeds of the cycad plant, but they, of course, do not wash them. Because of this, BMAA builds up in bat flesh. Researchers found toxin levels in bat flesh to be “hundreds of times higher than in cycad flour.”8 Avoiding eating and touching bats is a great idea. We did not know why until recently. Moses’ most likely did not have all the details either. But the fact that he included bats in his list of unclean animals provides yet another piece of evidence for the divine inspiration of the Bible. 1 “Bat ‘Super Immunity’ Could Help Protect People,” ScienceDaily, CSIRO Australia, https://www.sciencedaily.com/releases/2016/02/160222155631.htm. 4 I have written about this in the book Behold! The Word of God (2007), Apologetics Press, http://apologeticspress.org/pdfs/e-books_pdf/Behold%20the%20Word%20of%20God.pdf, p. 124. 5 Eric Lyons (2009), “Did the Bible Writers Commit Biological Blunders?”, Apologetics Press, https://www.apologeticspress.org/AllegedDiscrepancies.aspx?article=2731. 7 Lucy Maddox, “Don’t Eat the Bats,” Science, http://www.sciencemag.org/news/2003/08/dont-eat-bats.